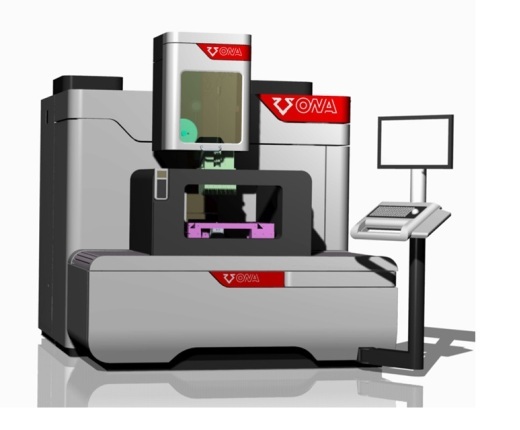 Some of the most important features of the new ONA AV25 premium wire edm machine are the following: 8-axis CNC with CAD/CAM integrated and 21,5-inch touchscreen, capacity for working with very thin wires of only 0,07 mm of diameter, a new superfine-finishing generator that allows to reach a minimum surface finish of 0,1 microns Ra, new ecocutting technologies that reduce the consume of wire and a new energy control system that reduces electricity consumption up to a 30%. Moreover, ONA will exhibit a robotised cell made up of a piece and electrode changer robot with a maximum of 160 position and a new version of ONA NX4C machine, equipped with new high-speed head and a new servocontrol system with a capacity of up to 1 G (10 m/s²). This robotised cell will show the manufacturing of a close blisk (bladed integrated on disk) corresponding to a jet engine.